The word 'iconic' is wildly overused, but I'm going to go ahead and use it about Anglepoise lamps. Designed in Britain, they're a true 20th century classic that, thanks to regular colour revamps, is still going strong in the 21st. 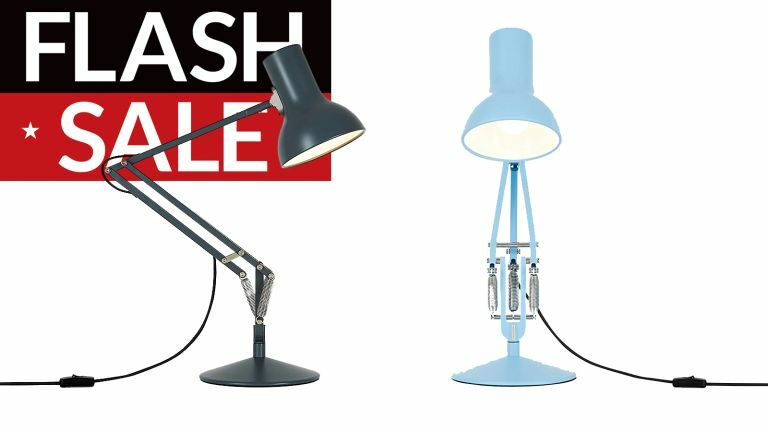 And today, you can get an Anglepoise Type 75 Mini with a big discount. It's a real lightbulb moment! Quite literally! Designed in Britain by Kenneth Grange, the Type 75 has proved to be an enduring classic, found in countless offices and, more laterly, homes. The Mini, as you would imagine, is a more recent, scaled down version meant more as a style piece than as a work lamp. Despite that, it keeps the heavy base of the original, along with the easily and endlessly moveable aluminium arms, with stainless steel fittings. An E14 mini screw fit bulb is required – perhaps a Philips Hue might suit you? An LED bulb is provided, though. Anglepoise's 'constant tension spring technology' allows for a great range of movement. The heavy base means it has perfect balance, making it possible to move the adjustable, handsome shade to all manner of positions, which it then holds. The Type 75 Mini series is a scaled-down, 'fun' update of the Type 75, 'offering all the functionality… in a more compact and colourful form.' The smart satin finish is durable and chic.